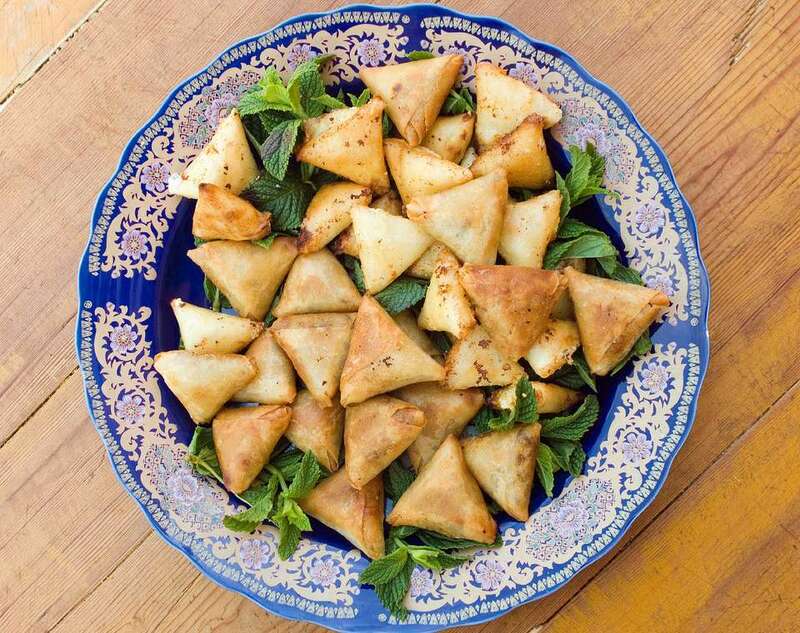 Savory Moroccan pastries known as briouats are popular appetizers or tea time fare, but in my home they're most likely to show up on my iftar table in Ramadan. In this version, the pastries are stuffed with a simple spinach and cream cheese filling. For variety, a well-strained fresh cheese such as Moroccan jben or ricotta may also be used. Briouats are traditionally wrapped with a Moroccan pastry called warqa, but outside of Morocco you can substitute flour-based spring roll wrappers or phyllo dough (#10 country style is best). Add the onions and saute for 5 to 10 minutes, until tender and translucent but not browned. Add the garlic and saute just for a minute or two, until the garlic is fragrant. Add the spinach and saute until wilted, tender and reduced in volume. Remove from the heat and place in a strainer or colander. Press and pack the spinach to drain the excess liquids and leave to cool briefly. Set the filling aside and refrigerate until needed, or proceed to folding the briouats. Note: I like to fold spinach briouats into triangles, as described below. If you prefer, you can fold them into cylinders as you would for egg rolls. With scissors, cut sheets of warqa, phyllo or spring roll pastry into strips about two to two-and-a-half inches wide. Place a single strip of warqa or spring roll wrapper – or two layered strips of phyllo dough – on your work surface. Lightly brush butter on the bottom two-thirds of the dough. Place a tablespoon of filling towards the bottom of the strip, and fold the bottom up to enclose the filling. Fold the bottom left corner of the enclosed dough upwards to the right, aligning it with the right edge of the strip. Then flip the bottom right corner upwards to the left, aligning it with the left edge of the dough. You should see a triangle take shape. Continue folding the triangle, flipping right and then left in this manner, and aligning the edges, until you reach the end of the dough. Repeat with the remaining dough and filling. At this point the briouats may be covered and refrigerated until cooking; or, they may be frozen for up to two months for later use. Frying is the preferred, traditional method of cooking the briouats. Heat one inch of oil in a deep skillet or wide sauce pan over medium heat. Deep fry the briouats in batches until golden brown, turning several times. Drain thoroughly and allow to cool 10 minutes before serving. If you prefer to bake the briouats, preheat your oven to 375° F (190° C). Brush the pastries on both sides with melted butter and place them on a baking sheet lined with parchment paper. Bake for 20 to 25 minutes, or until golden brown and crispy. Briouats stay warm for 30 minutes or longer, and can be enjoyed at room temperature. However, if if frying them well in advance of serving, you can reheat them in a 350° F (180° C) oven for about 10 minutes, or until very hot and crispy. Leftover briouats that were refrigerated will take a bit longer to reheat and crisp up.